I think this is the longest break I have taken from my blog, though it wasn't intentional. During my vacation I had expected to post a few things and for someone reason (Mass Effect 3) I didn't (Lego Batman 2). But I'm back and with a recipe that quite literally trounced all of my expectations. Let me take you back to a time when I didn't have to worry about work or even showering the next day: Tuesday last week, the second "official" day of my vacation. I was craving something strawberry but had none. To satisfy this craving I went out purely to purchase strawberries (and perhaps some Greek yogurt) and after a rather lengthy trip (I won't bore you with details) I had six pints of strawberries all softly whispering the word "pie." 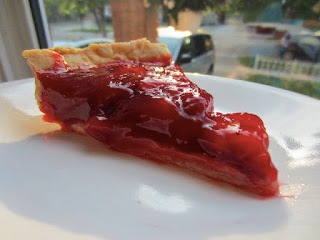 What surprised me most about the majority of strawberry pie recipes I found was that they were essentially jam recipes poured into a crust. Not that I'm complaining, I love jam (especially strawberry) and an excuse to eat it in the guise of pie was instantly appealing. Not to mention insanely easy to make. There is nothing difficult about this recipe, blind bake the crust, halve some strawberries, puree some strawberries, pour nearly everything into a pot and boil. Bam done. My only change to the recipe was to add a bit of cinnamon. Cinnamon might not be the first thing you think when you hear strawberries but the flavour combination is terrific, especially when your strawberries are fresh and bursting with flavour. My filling didn't turn out as firm as I think it was supposed to, which I attribute to absent mindedly bringing the filling to a boil too quickly. However, this didn't stop the pie from being absolutely delicious. It was sweet but not too sweet. The flavour of strawberry was fresh and bright with just a hint of cinnamon. It was insanely good. And despite the filling being a bit runny my crust held up perfectly, staying tender and crisp (if that makes sense). As soon as the pie was gone I wanted to make it again. I wouldn't change a thing. I had originally planned on adding some type of whipped topping or meringue to the pie. If that's your thing I'm sure it would be delicious, but I'm glad that I didn't (not for a lack of trying... don't ask). Quite frankly, it doesn't need it. It's not exactly gilding gold, but it might be painting lilies (or hu-ing rainbows? :)). 1 9" pre-baked pie crust -- My favourite pie crust or your own :). To pre-bake crust see instructions from Simply Recipes. Add 1 1/2 cups of strawberries to food processor or blender and puree. Add strawberry puree, sugar, cornstarch and water to a small saucepan, stir to combine and place over medium heat. Bring mixture to a boil stirring occasionally. Boil for 1 minute then stir in vanilla and cinnamon. 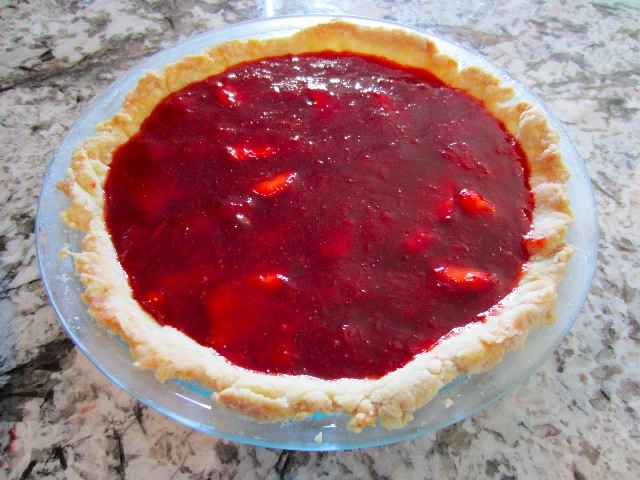 Add remaining strawberries to cooled pre-baked pie crust and spread evenly. Once filling is warm to touch pour evenly into pie crust. Allow to chill in fridge for at least two hours before serving.